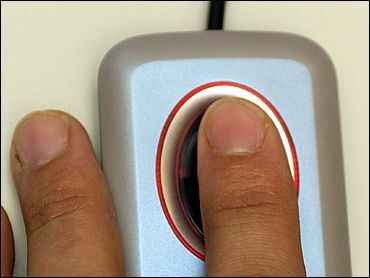 Instead of using all ten fingers to type in your user names and passwords when you enter a secure web site or log on to your PC, Microsoft wants you to use the tip of just one finger. They're not promoting "hunt and peck" typing, but fingerprint recognition as a short cut for passwords and usernames. The company just announced a new keyboard and mouse with a built-in fingerprint scanner as well as a stand-alone scanner called the Microsoft Fingerprint Reader. I'm testing the keyboard with the built-in fingerprint scanner. The keyboard, along with a wireless optical mouse, sells for $104. The mouse with the built-in fingerprint reader costs $84 and the stand-alone reader sells for $64. Once you install the software and plug in the device, you're asked to register your fingerprints. You do this by placing a finger in the center of the small red sensor. Within a few seconds you'll hear a beep indicating that the fingerprint has been recorded. You then do it three more times so that the software gets a more accurate picture of your fingerprint. You can register as many of your fingers and thumbs as you want. Then when you visit a Web page that requires a logon, you simply touch the sensor pad to bring up the "create fingerprint logon" screen. You type in your username and password once and, from then on, all you have to do to log on to the site is to touch the sensor. There's no need to type in the password though you should still write it down in a secure location in case you need to look it up later. The coolest feature of the new system is the way it quickly logs users on and off Windows. Families or businesses that share a PC can assign an account for each user, each with their own password. Once a user has been registered with the Microsoft Fingerprint system, they can sign on simply by touching the sensor. And, if you touch the pad while someone else is logged on to their account, the system will immediately "switch users" by hiding their screen and logging you on. It's the fastest and most convenience way to switch from one user to another and it's especially good for young children because it doesn't require any typing. It's long been possible to create a separate account for each of your children, blocking them from your files as well as inappropriate content. This system just makes it easier for them to log on to their protected account. Microsoft cautions that this system is not fool proof and "should not be used for protecting sensitive data such as financial information or for accessing corporate networks." The company recommends "that you use a strong password for these types of activities." Still, I tested the reader with several people, who were not able to log on to any of my accounts. Even when I used the wrong finger -- one that I hadn't registered with the software -- I was locked out of the site until I used the correct finger. Microsoft is hardly the first company to incorporate fingerprint recognition into PC products. Several companies, including Toshiba and Key Tronic, offer a variety of products with similar features. MPC (formerly Micron) has long offered laptops with a built-in fingerprint reader. Still, Microsoft did a very good job implementing the technology. I'd give it "thumbs up," but it only works if you place your thumbs or other fingers down.